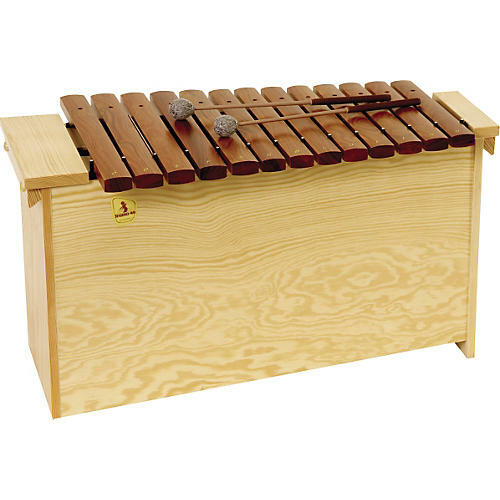 The Studio 49 1600 Series Xylophones are perfect for use with elementary students. The 1600 Series Xylophones feature bright Rosewood bars for a deep rich tone. The resonance box features a 12 mm solid pine construction with multiple resonance chambers for a rich sound quality. The compact design makes these instruments ideal for any age music classroom plus the integrated handles are perfect for easy transportation or for mounting the instruments on mobile stands. All diatonic units include F# and Bb bars plus a pair of S Series mallets. The Studio 49 1600 Series Xylophones are available in diatonic units for soprano (SX 1600), alto (AX 1600) and bass (BX 1600) or in chromatic resonance units for soprano (H-SX 1600), alto (H-AX 1600) and bass (H-BX 1600).